This review is of the edited TV-14 version of the film. All thoughts below should be addressed as such as a review of the unedited version would be more negative. It’s time for a CIA type revenge thriller. Revenge films can always be tough since naturally the lead is getting revenge for something which means a tragic backstory. Some films take this as far as they can. What’s the saddest thing that can happen? Usually it involves family dying, sometimes it’s the film dying (By having the dog die) but there are many different versions. The film has to be careful not to make the scene too tragic/mean spirited or the movie is over before it has begun while still trying to make the scene reasonably emotional. It’s a tight rope act. Richard used to work for the CIA, but lately he has a hard time murdering people. He wants out and decides to just walk away. Naturally you can’t just walk away from a job like this but he’s the best in the business so it’s reasonably easy to dodge his former subordinates. He finds himself in a small town that has been taken over by corrupt cops and thugs. They want to commit terrorist acts against the country and see Richard as a threat. They decide to destroy him and his newfound friends to teach the guy a lesson. Richard will have to either stop the enemies or avenge his friends. This film has that gritty 80s vibe to it from the start. You never really feel like Richard’s friends have a shot here. They all mean well and are pretty nice but that’s exactly why they seem expendable. You have the kid who looks up to Richard, her father who refuses to sell his land to the villains (uh oh) and a CIA agent who has arrived to arrest Richard but decides to team up with him instead. Death flags will pop up for all 3 and the real question is who will live past this ordeal. Also since the cops are involved and corrupt this can lead to the frustrating scenario where they can and will arrest Richard for anything just so they can take his guns. They can even just handcuff him so the villains can beat him up without a fight. When the cops are in on it the hero is put in a very bad spot. It’s pretty hard to overcome this because after a point the only option is to take down the cops and the villains which will lead you to becoming a fugitive across the country. It’s a tough spot for sure. The film does a good job of painting a bleak picture for Richard. It’s certainly a thriller with high stakes. I can’t say that Richard does a bad job against them as he reasonably does all he could, but I think he begins to falter with the romance angle in general and some of his decision making skills. He may not have had to go for revenge if he had planned things out better. The romance angle here is definitely very weak though. The CIA agent coming over just to be swayed by Richard was certainly a bit much. There goes her professionalism. I can understand her not wanting to listen to the corrupt order to murder Malone, but there’s a fine line between that and getting together with him. Then the film also has the kid start to like Richard which makes for a very tricky plot. Especially since Richard is not nearly as firm as he should have been in declining her. He’s at least 30 years older than her, maybe more so. It was just a lousy plot. The film should have absolutely skipped the romance plots in this film and that would have been a really good idea. It’s all pretty unnecessary. Naturally the film can also be a bit gritty. I wouldn’t say that it ever becomes over the top violent or anything but it’s definitely got that 80s vibe to it. The deaths can be pretty gruesome even if they aren’t all on screen. It’s basically what you would expect from the premise. Unfortunately the CIA part of it doesn’t get as much screen time as I would have liked. It would have been nice to see the CIA step in and start fighting with the villains. After all, while they want to cover all of this up you’d think that they would also be happy to take care of the local mob and cops right? Instead they also appear to be just as corrupt as the villains. The film tries to make it crystal clear that only Malone and the two people he’s living with can be trusted. 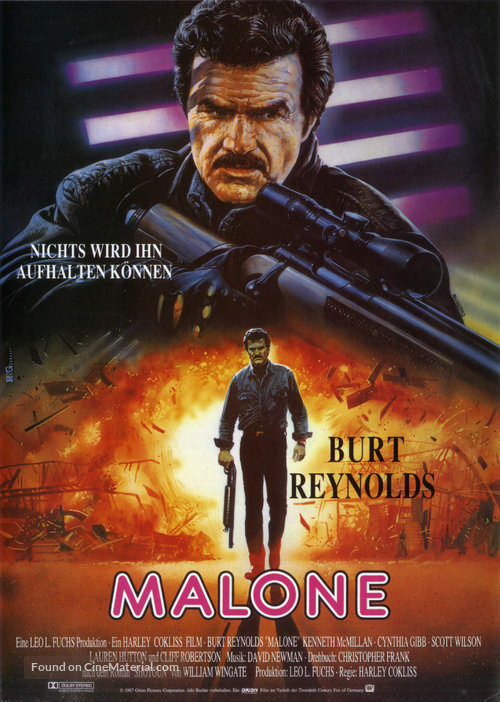 Overall, Malone isn’t a film that I would particularly recommend. It feels a lot like some of the wild west films like Hang em High and other such titles with the tough main character who shows up to take down the villains but simply isn’t nearly as engaging as those were. The main character isn’t quite as good and while the villains were reasonable I guess they don’t do anything to save the film. It’s not a very pleasant film either. Naturally it’s fun to see Malone go in and take down the villains, but by the time he does it feels like an empty victory. It’s time to look at an old Wild West film. This is the kind of adventure where the cops are long gone so it’s all up to one hero to save the day. Most modern films like this one can get a little tricky since it easily can become a very mean spirited affair. You see the villains murder a bunch of people and then the lead does the same to them. The films are meant for you to root for this kind of revenge since the villains need to get what’s coming to them, but it just ends up being a vicious cycle. That’s why these films were so much better back in the old days since the encounters didn’t even have to be violent or anything like that. It was just a classic Cops and Robbers game. As such, this film isn’t all that bad, although I still can’t say that it was very good either. The film starts off with a guy doing some farm work. He’s been warned repeatedly that there are some bad people in the neighborhood who want him to get out. Our confident lead is confident that they won’t hurt him and to prove his point leaves his gun behind. The villains murder him and move on back to town. That’s when Trace walks in and sees what has happened. He vows revenge on the hooligans, but quickly learns that this may be too difficult a task. He is badly outnumbered and gets injured quite a lot. What can he do? Considering that the town is basically filled with villains there really isn’t much that Trace can do. These old westerns are always a little interesting with all of the unspoken rules going around. Everybody has a gun, but nobody dares take the first shot since the quick draw may be a little too good on the opponent’s side. As a result there are a lot of staredowns and subtle threats. I’ll give Trace some props for being a fairly good shot. That being said, how did the villain not die when he was plugged twice? In a situation like that, this is exactly why you have to fire off multiple shots to make sure that they actually landed. Otherwise you have this kind of issue where the villain comes back for more. Trace was also doing well in that room so he probably could have picked off more of them 1 at a time. Eventually he would run out of bullets or they would get wise to the plan, but it would definitely thin out the ranks. As it is, he does take an awful long time actually getting to the army base. He has to take frequent breaks and as I mentioned he does spend a great deal of the film being injured. Fortunately for him a girl named Maria is around. She tends to his wounds and decides to aid in his quest since her father was murdered by this guys a long time ago. It is quite personal for her now as you can probably imagine. She does a good job of sticking up for herself throughout the movie and even takes out a gun at one point. Unfortunately she did miss her shot, but the attempt is the important thing. Unfortunately we do get a very forced romance between her and Trace. You could probably feel that romance coming from a mile away. The romance could have been worse of course, but it just could have not been around as well and that would have been even better. Aside from the main 2, another solid character was the head of the tracking squad. He seemed like a pretty reasonable character. While he is still a villain and lets the others do what they want for the most part, at least he doesn’t actively enjoy the murders like the others. He also doesn’t randomly try to destroy non targets as well. Naturally things don’t work out too well for him. The Indian tracker who was forced to help was also a fun character. He did his job, but at the end of the day he certainly do anything more than that and at the soonest opportunity he was ready to go back into town and mock the villains. One custom that I’m glad was stopped was branding the horses. I don’t care f the characters believed themselves to be heroes or villains, the branding process seemed rather painful. It’s definitely not something that should have been done and while it may be hard to identify your horse otherwise, you gotta go for a different approach. The film did a good job of making sure most of the horses got away although one injured its leg which was unfortunate. Lets just keep the horses out of these films, they didn’t deserve to get mixed up in a war like this. Overall, The film plays out this plot by the books. You can probably imagine how it’ll all go down, but it does a fair job of executing this story line. If the villains had been a little better that probably would have helped the movie out. As it stands, Maria’s family was also annoying as how they cowered whenever the villains would show up. There comes a time where you gotta stand up for yourself and these side characters could never quite get that. 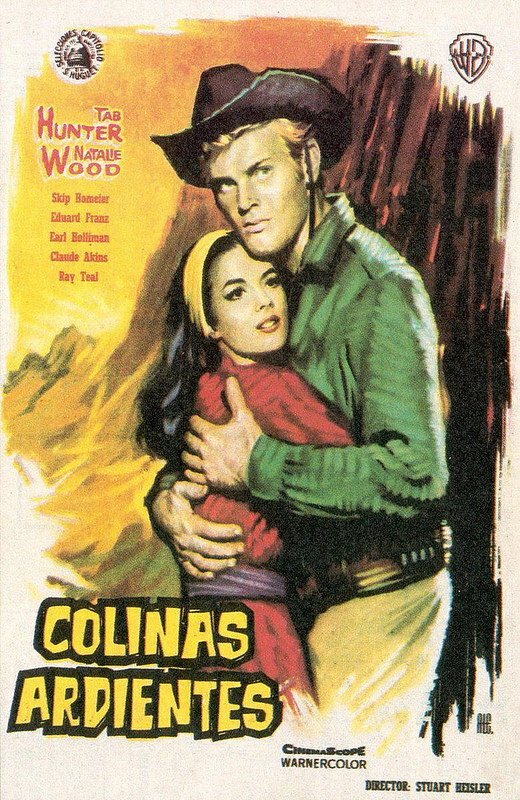 If you like these old westerns then you should check this film out. It’s fairly interesting. It’s time for one of those films that has always been known as one of the worst. It’s always an interesting experience to go into a film knowing that there is over a 95% chance that it’s going to be terrible. Well, Mad Max certainly lived up to the hype. There is no real plot and the writing is worse than an Adam Sandler film. There are no redeemable qualities for this film whatsoever and right away you can tell that this film is going to be a chore to get through. If this film was intending to be good then it failed miserably but if deep down its intention was to be known as the greatest mess of a film during its time, then perhaps it succeeded. Either way, I think we know what the score is going to be here. The film starts off with the corrupt cops knocking each others cars over and getting steamrolled by two random crooks in a car. Nobody in this film knows how to drive and that point will keep on getting brought up over the course of the film. If the villains even so much as try to turn, then the heroes get knocked over because they can’t do the same. The cops nearly lose this round, but the villain randomly crashes and blows up. Now there is a biker gang on the loose who are trying to avenge the other villains and go around blowing up cops and murdering towns. Max, being the hero that he is, decides to run away and leave the rest of the cops to fend for themselves. He takes his family to an abandoned part of the forest where nobody can possibly help them and then runs off again. They’re murdered and now Max has to try and avenge them. Thing is, if he wasn’t even remotely intelligent prior to this..is he smart enough to finish off the job? Where to start with this film? First off, the writers should clearly rethink their careers because the story is as nonsensical as it can be. There is no focus to the story as its just the bandits messing around with everyone. They might even have more screentime than the main lead and half of the time it’s just them acting obnoxious and yelling a lot. Nobody even makes any logical moves. Take Max for example. Since he was a cop, he knows all about the biker gang and how they target anyone they come across. This also seems to be common knowledge across the country in this alternate future. Why would he possibly leave his family alone once they made it to the woods? This area isn’t far from all of the biker gang attacks after all so he should have gone with them. Even once he meets up with the family, he deserts them again in the very next scene to check out the forest. Finally, when he is trying to murder all of the bikers, he falls into their very obvious trap. Maybe if the film was trying to portray him as an unintelligent person then it would be decent writing, but this is clearly not the intent. Nobody looks smart here and unless this is a film that’s actually taking place in the past and everyone’s a caveman, then it just doesn’t work. The rest of the cops? Don’t worry about them since they never actually get a role in the film. Like I said, over half of the film is about the villains and the last 15-20 minutes are about Max’s payback. Nothing else that we see in the film is ever important and most of the scenes can be considered as filler. An important thing when constructing a universe is to make sure that everything makes sense. If you live in a society where there is no law and you’re in constant danger, then everyone should always have a gun at the ready. If driving fast is essential to staying alive, then you’d expect people to know how to drive right away. Yet, nobody actually acts like they live in the world that they’re set in. Characters act as if they’re in a normal world and are then surprised when they are constantly attacked. 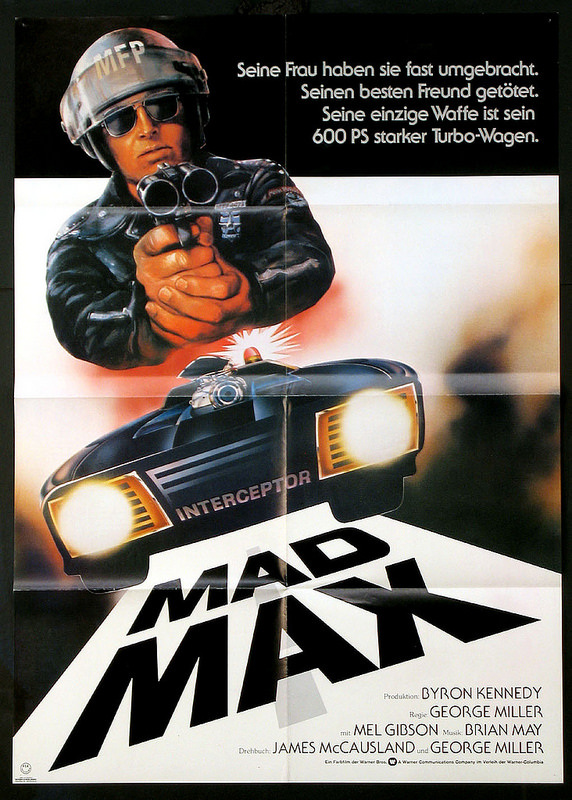 Mad Max is also a very mean spirited film as you might expect. The villains have their way with everyone and the heroes always suffer very slow deaths or fates worse than death. This film is quite graphic and dark. There’s never any actual happy scenes so instead the film plays the happy tunes when the main character tortures and murders the villains. Definitely shows you what the writer was thinking while writing this. It’s definitely a film that is trying its best to be as edgy and over the top as possible. It definitely succeeds in that regard and with all the shock value thrown into the film I suppose it was never trying to have any sort of quality anyway. This is the kind of film that you can chuck into the can within minutes. I can’t imagine being in the theaters for a film like this. You’d be dashing to the front to get your refund so fast that you’d be a blur. The problem is that everyone else would have the same idea so it would still be tough. At least the film has a soundtrack so I suppose I should see that as a silver lining, but since the sound director had no idea what he was doing, the music is placed in all of the wrong scenes. It never actually makes sense and I get the feeling that the person in charge of the music didn’t actually watch the movie. Smart idea actually so he’s probably the smartest guy on the team. I can’t really put too much blame on the guy as a result. There’s not too much more to say and bash about Mad Max since you get the drift. If the characters are poorly written, the plot is nonexistent, the music isn’t placed correctly, the writing for the universe and everything in it is terrible and the script is terrible…what is left for the film? Even the scenery is rather bland as it’s just a bunch of roads and we don’t have any cool buildings. Everything is torn down and old, just like this film. You can get to snoozeville before you actually find something interesting about this film. If the writers couldn’t be bothered to make an actual story why would you even want to try to find one? There is nothing to be found here, only despair and decay. Max Max’s main incentive for viewers is to see a revenge story. It’s supposed to be exhilarating because they make villains that are really mean and then you get to see the hero become just as mean as he destroys them all. It’s just such a poor way to try and create a plot. Revenge fantasies are just no good as the “hero” ends up becoming just like the villains in his mad quest for vengeance. Still, it’s a popular writing technique for writers who don’t know what else to do because it is extremely easy. Just have a bunch of tragic things happen that causes the hero to snap. You could come up with a plot like this in seconds and that’s likely what the creative staff here did. You could probably come up with a better plot and script in a few minutes than what we got in this film. Overall, This film is definitely a disaster. It’s the kind of movie that you play to get everyone to shut off the TV and save electricity. There’s no enjoyment to be found here and you’d have a lot more fun just taking a nap or watching a show about paint drying. Sure, paint drying is the classic example, but at least it’s so much of a meme that it would still be a little entertaining as you just space out. I don’t have any real hopes for the sequels to be honest, but how much worse can they get? I know that a film can always get worse, but you do really have to try to be this level of bad. Next time you think of watching Mad Max, remember that nobody deserves to have to watch this film. That’s just how bad this movie is.